They say that cleanliness is next to godliness; if so then this latest diver’s model from Italian watchmaker, Cavenago is an immaculate conception. 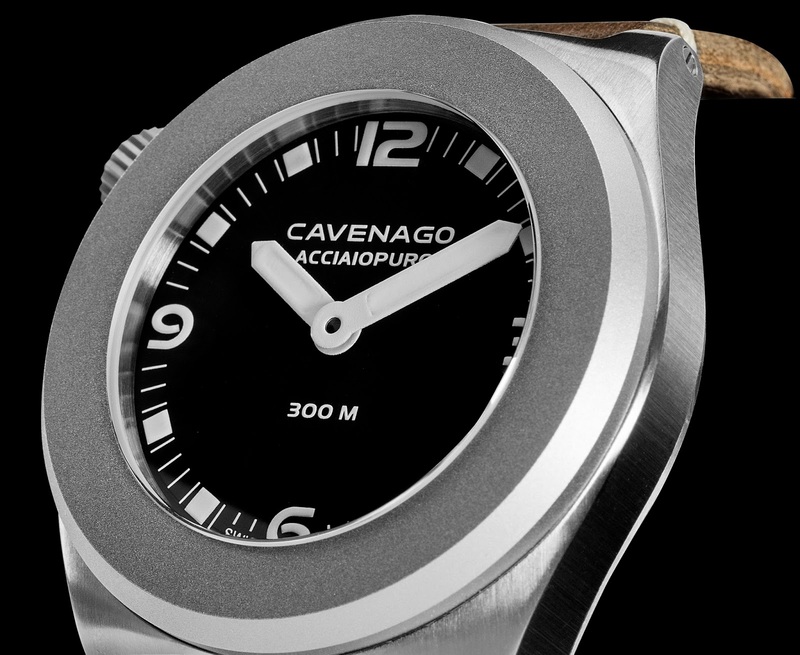 Conceived in their design studio in Milan and hand-assembled in Switzerland, the diver named Acciaiopuro or Pure Steel is imbued with sense of clarity and purity. Its minimal design harkens to the earliest days of diving while its high specification and proud case-back engraving are clear reminders that nothing was sacrificed for style. The Cavenago Acciaiopuro AKA PureSteel’s case has been made from Stainless steel - its design is ever so slightly asymmetric on its left side in order to perfectly accommodate and protect the crown positioned at 10 o’clock from any unwanted knocks. In this way, the case shape remains functional while retaining the clean and minimalist aesthetic of the timepiece itself. Moreover, the positioning of the crown in such a way also allows for absolute freedom of movement by the wearer’s hand and wrist no matter what the situation. 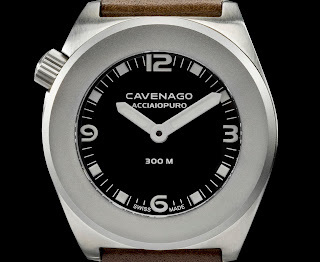 Water-resistant to 300 meters, the in-house designed case boasts a combination of solid vertically-brushed steel measuring 46mm in diameter with a sand-blast-finished, sterile fixed bezel - perfectly highlighting the watch’s unfettered style while providing a sturdy housing for the watch’s inner-workings. A domed Sapphire crystal, a screw-down crown system and solid case-back complete the list of diver’s features. However it is under the dome of the crystal where the Acciaiopuro’s matte black dial continues to tell its story of simplicity. 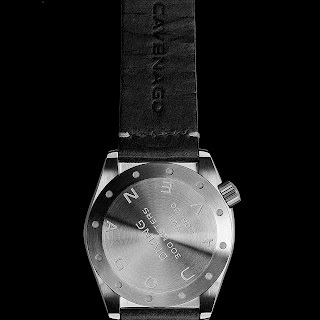 Cavenago’s signature oversized hands meet simple block markers which have been combined with Arabic numerals at 3, 6 and 9 o’clock and matchstick markers in-between – all in white perfectly contrasting against the black – all coated with SuperLuminova ensuring optimal readability in the dark. 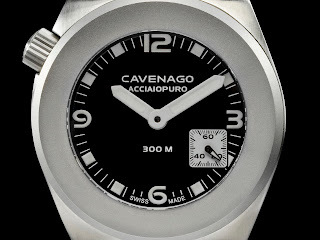 At 3 o’clock there is an option for a special white sub-seconds indicator. 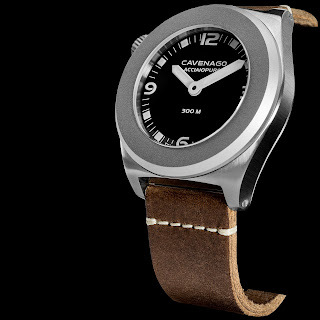 Opt for the pure style of the former Ref. 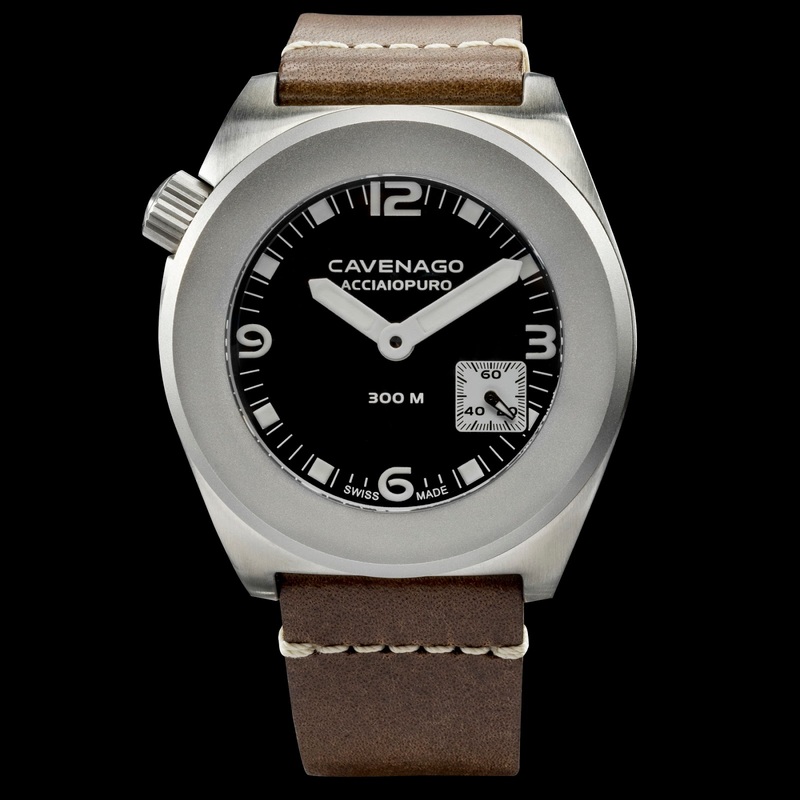 CAV-1025 or the quirkiness of the latter CAV-1024 – both are powered by a 17 Jewel Swiss made hand-wound ETA 6497 caliber which has a beat-rate of 18.000 VPH. The Cavenago Acciaiopuro comes on a hand-stitched leather band. 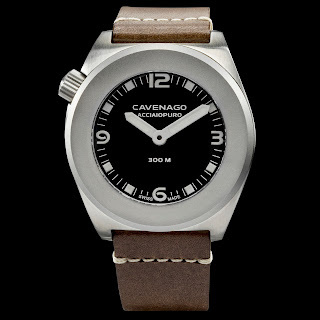 As per Cavenago company policy, production is limited to 100 pieces per each reference. 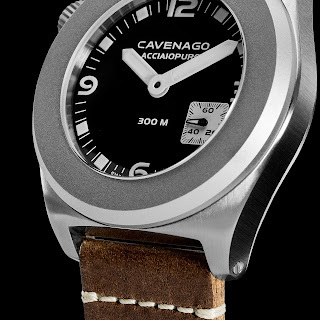 Follow the link embedded, below for more info. I purchased this watch because it has 3/6/9 and 12, minimalist and i own numerous high end dive watches, this is a stellar time piece, the dive watch clutter has become overwhelming in the market place. 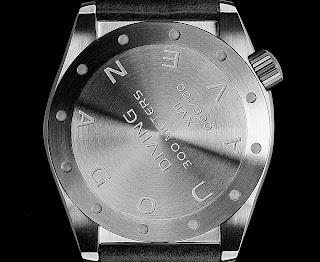 Oceanic time superior web site.